Since self-driving cars don’t have drivers, the cars have to perceive their surroundings themselves. Lidar is a great option—it’s like radar but with lasers instead of radio waves—but it’s big and pricy. 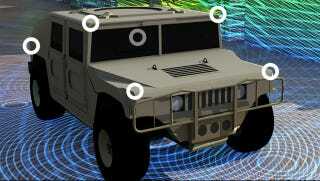 However, a new kind of lidar from DARPA could change that. DARPA, the U.S. Department of Defense’s emerging tech branch, announced the new tech last week: It’s lidar that’s small enough to be put on a microchip. These tiny scanners can help self-driving military vehicles survey surrounding terrain to steer, improve targeting capabilities, detect nearby chemical or biological weapons, and more. They’re calling the new system SWEEPER. It sweeps data-gathering lasers back and forth more than 100,000 times a second, which is 10,000 times faster than current lidar. Right now, lidar systems are big, honking, ugly things that stick out from the bodies of experimental cars—meanwhile, DARPA’s little lidar chips could be discreetly blanketed all over a vehicle. And while lasers are super accurate and can generate great maps for self-driving cars, they’re guided by mechanisms that are often big, slow, and sensitive to temperature swings and impacts. Not only is SWEEPER cheaper, but it also steers the lasers without using mechanical means. Instead, it uses tiny arrays of emitters that “control the direction of selected electromagnetic signals by varying the phase across many small antennas,” a press release says. Since SWEEPER is smaller and less expensive, it opens more doors to commercial use. With lidar (an acronym standing for light detection and ranging), the lasers bounce off whatever’s nearby, and then travel back to the sensor. The distances the lasers travel are measured and are used in conjunction with tools like GPS to generate data detailing the environment. SWEEPER covers a 51-degree range, which might not seem like a lot—but it’s the widest field of view ever achieved by such a small scanner. These miniature sensors could be tiled to gather data from many different points and collect it in a single panorama. We’ve got a long way to go until self-driving cars are smart enough for widespread adoption—but tech like this is bringing that future into clearer focus.